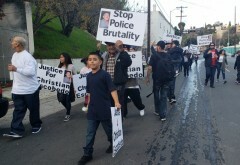 Peace walk held for sleeping man killed by LAPD | Fight Back! Los Angeles, CA – Chanting, “Say his name! Christian Escobedo!” and “If we don’t get no justice, then they don’t get no peace! No justice! No peace! No trigger-happy police!” on January 12 over 60 neighbors, family members, friends and allies gathered on Galena Street and Amethyst Street – where Escobedo was shot and killed. In the early hours of January 14 the year before, Christian Escobedo, who was 22 years old at the time, and a friend were asleep on the street. Someone called LAPD and the officers walked up to confront Escobedo, shooting him without provocation. LAPD claims they saw a gun, the friend ran, and they feared for their lives. Escobedo died almost instantly when LAPD shot him four times – once to the head. From the site where Escobedo was killed, the large crowd marched on the route Escobedo would have traveled - if he had lived. At the end of the peace walk, the crowd wrote messages on white balloons and released them.